Once again, I was off on my bike for a camping trip, but this time in February in SE Iowa! The fields were faded tans and browns and the trees were leafless skeletons, but the sky was blue and the temperatures in the high 60's. The next morning would be around 50, and the extended forecast predicted a return to more normal (lower) temperatures soon. One day for a quick overnighter. 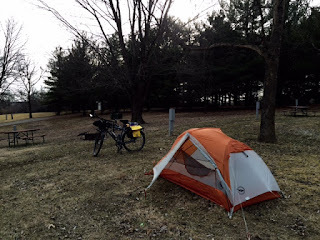 This trip made the third year in a row that I started my bike camping season with an overnighter to Round Prairie Park in Jefferson County, Iowa. It's fourteen miles from my front door, and even the moderate headwind didn't faze me. The hills on Glasgow Road, the gravel on Tamarack Road, and the utter isolation of the empty campground in February were expected, almost old friends. The rookery of crows in the distant trees with their cacophony of raucous cries also brought back memories. I remembered my first trip to Round Prairie Park, coming off a spring cold and still weak, struggling to get home the next day, having over-packed to "see how the bike handled with a load." Well, it handled like an over-packed bike! Lesson learned. This year, my ultra-light tent set up quickly after my 3:30 P.M. arrival, and I even had time for some stretching asanas and meditation before dark and dinner. The sun sets early in February, but the fresh air and the glowing sky gave promise to an easy night's sleep. We'd see what the morning brought because a fifty percent possibility of rain and then later thunderstorms were forecast. I knew that when I was heading out, but the chance to enjoy an early trip balanced out the possibility of a few miles of riding in the rain. And I did bring my rain gear! I woke at 2:30 A.M., having slept six hours. 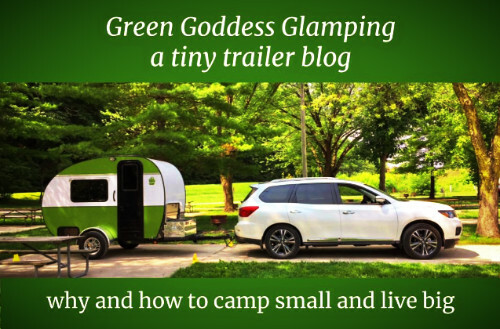 The soft glow of the campground's streetlight lit my camp spot, and I had the thought: "I'm awake, slept well and feel great. Why not pack up and head home now, before the rain?" Well, somehow I just didn't roll over and go back to sleep. Part of the surge of energy I experienced was the thought of my new bike's dynamo and lighting system. I'd get to use that! 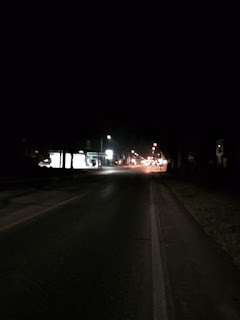 So pack I did and took off, my light illuminating my way down the two miles of gravel road, the ten miles of Glasgow Road, and the two miles through town to my home. It was a pleasant temperature, the bike handled well, and one side perk of the early ride was having only three cars pass me on my twelve miles to town. I pretty much had the road to myself--and a tailwind. It was a much faster trip home than out, and I felt strong. I like to start my riding season with shorter rides, though, to give myself a chance to get in shape without excessive fatigue. My one concern was that I was showing up home at around 5:15 A.M., and I didn't want to startle my wife with my unexpected arrival. I texted her when I got to the garage, but she didn't respond. I phoned our landline from the front door, left a message, and I could see her through the window coming to the door. She was sleepy but at least not scared awake by noises in the garage and house. In other words, she forgave me my perky, early morning sojourn. It is now a week later--cooler, rain expected, but I've managed to spend a couple of days in the yard, working in the garden setting up some cold frames. 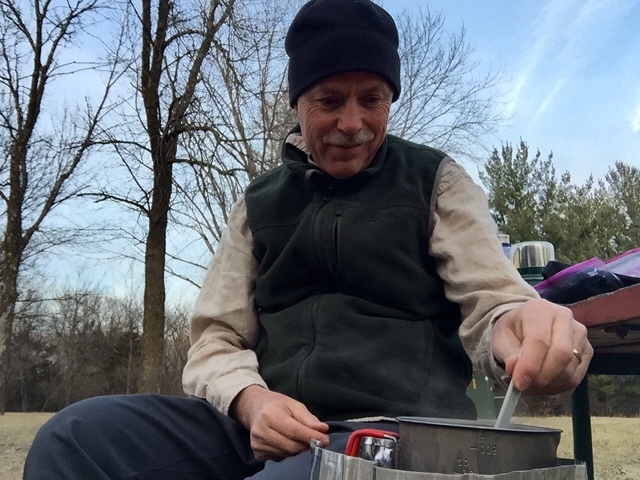 Kale is sprouting, I've spent some good time outside with my wife and grandson, and in addition to that, I've headed off once again to start a new year of bicycle adventures. Bless our state, county, and local communities that maintain our local parks and campgrounds. They really add to the quality of life available for us to experience just outside our back door.